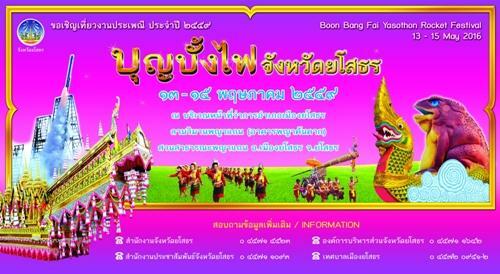 Hi, myself and a number of my friends were thinking of heading up to the Bun Bang Fai Rocket Festival in Yasothon. A handful of sources say it'll begin on the 6th of May but usually it starts mid-May and from watching Thai football here for half a decade I know how often dates get mis-communicated. Is there anyone up in that area that can confirm or who has good experience of the festival and can give some general advice on it? Any info appreciated. Cheers. Apparently it's the 13th (middle of the year as usual). I was apparently right to be sceptical of the date. Call a local hotel. They will know. Book a room at the same time. If anyone wants to see a really weird rocket festival and fertility festival, same time, head to Na chaluai, Lao land border, Emerald triangle. Rocket made to look like dragons, half the men, boys dressed as girls, wooden dolls screwing, and wooden penises everywhere. half the men, boys dressed as girls, wooden dolls screwing, and wooden penises everywhere. Yes, I can't see any flaw in that plan at all. Probably the best Thai/Lao film I've ever seen... I should get my parents to watch it sometime, especially given the career I'm in. especially given the career I'm in. What career is that then? Anybody in Yasothon seen a man wearing a mask like this?